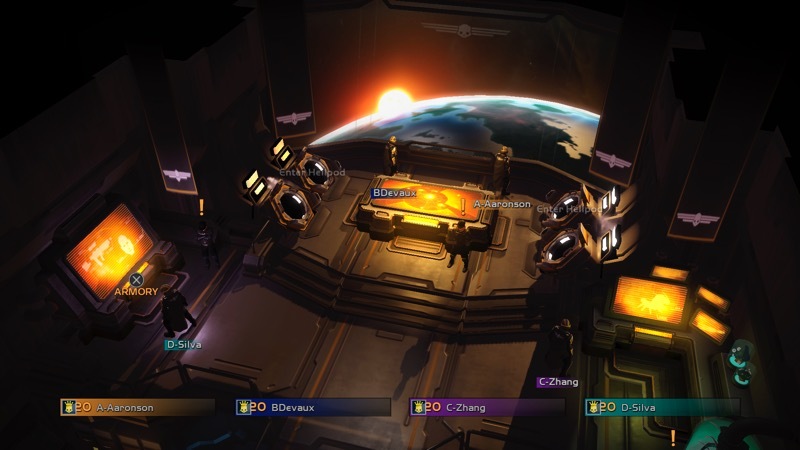 Helldivers begins as a quirky but typical top-down shooter. You are put through your paces in the tutorial and it all feels quiet generic. That is, until, you venture into space and discover that it is actually one of the grandest, most enjoyable experiences that you can get. The game opens in a hilarious patriotic future that feels like something ripped from Starship Troopers, Broforce or even (strangely) Warhammer 40k. Super Earth needs you and all the other Helldivers to fight together and spread managed democracy and our way of life to the evil alien forces. This leads to some genius ambient ejaculations from characters during combat including the smell of freedom or democracy in the face. However, the actual storyline is just a cute setting for the core gameplay and never seems to offer much in the way of plot or story development. Normally that would be a major detriment to the game, but instead it doesn’t really seem to matter because the gameplay itself is so addictive and fun. After the initial typical and boring tutorial, the game opens up as you end up on your own ship. Much like Mass Effect or Warframe, this is when the game exposes players to the galaxy map. Beginning with the first faction, Bugs, you realize that Super Earth is surrounded by factions of aliens who are intent on destroying your superior form of freedom. There is only one solution – you must spread freedom to all the planets in the galaxy using your incredible arsenal of guns, grenades and the ultra special concept – stratagems. 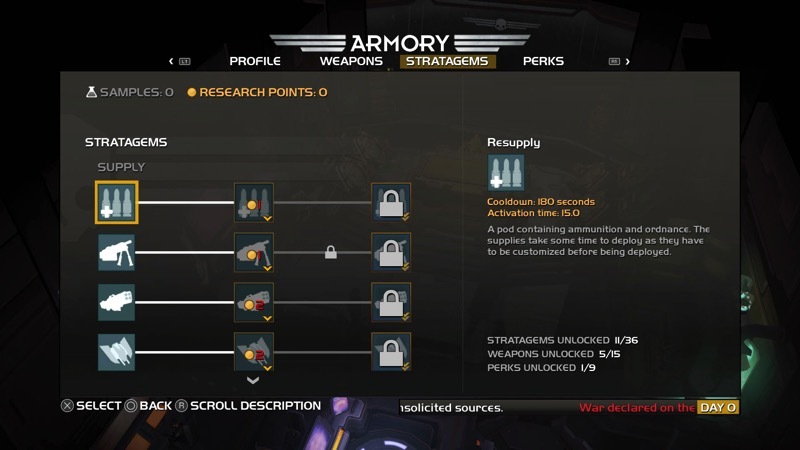 Helldivers isn’t content giving you a range of upgradable weapons. No, you also need upgradeable stratagems, special extras that you can call into combat after entering the correct combination of directional buttons. These range from defensive turrets to extra ammo or even summoning your fallen comrades back into battle with you. Be warned though – these literally fall from the sky and can kill anything on the ground where they land. It’s mortifying to be killed by your airdropped ally. Even more embarrassing – being killed by the rescue shuttle as is drops to the ground for your evacuation. 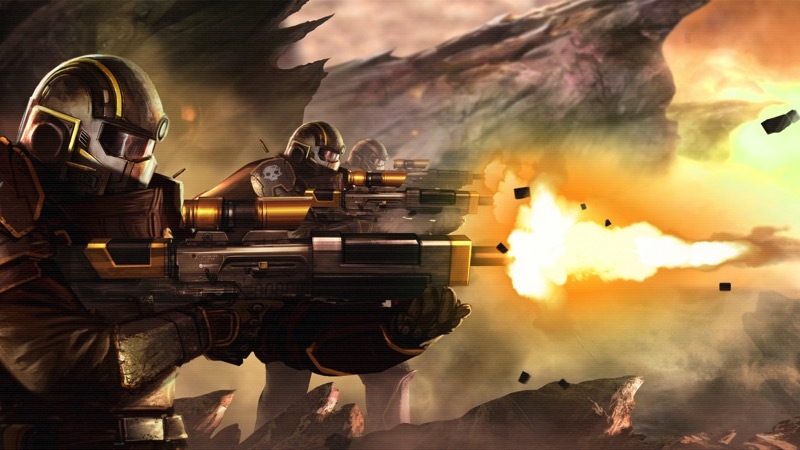 Yes, Helldivers has tons of ways to kill you. Most interesting is the use of friendly fire. For one who hasn’t experienced friendly fire in years, and usually hates it or disables it, this aspect of the game is one of the most compelling. It was endlessly amusing to realize that my spinning around to kill flanking enemies also resulted in my shooting a co-op partner in the face with my shotgun. However, thus far the community of people playing Helldivers seems to be really entertained by things as we all killed and revived each other multiple times without anything becoming toxic. One mech-suit wearing ally accidentally trampled me before falling off a cliff, something I found endlessly amusing rather than infuriating. This is what keeps Helldivers challenging without feeling punishing. 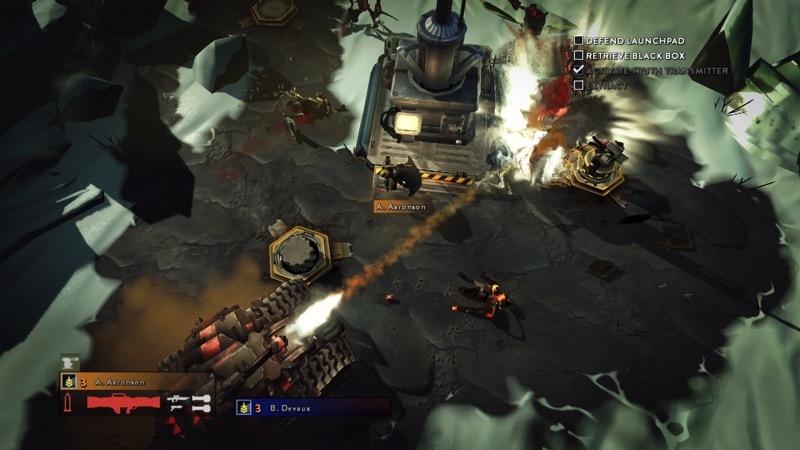 Unlike a Souls game where the environments themselves are built to be difficult, the challenge in Helldivers comes from individual failures. It was my own fault that I stumbled into a patrol of enemies, just as it was my own fault when I allowed myself to get killed by my own defense turret. Each planet is procedurally generated with a variety of objectives ranging from capturing points on the map to activating missiles or carrying briefcases slowly across the map. In some ways, these remind me particularly of Warframe. In fact, the game in general feels like the best parts of Destiny and Warframe combined in a top-down shooter. Even the co-op is similar, allowing other players to drop into your party during the mission with up to four-player co-op. As you prepare to drop onto other planets, you can even see other players’ ships doing the same. Playing the game solo is doable and fun, but it’s truly when playing with others that the game opens up. Thankfully, this is where the game takes a major departure from Warframe or Destiny – it allows for couch co-op so you can play with friends in the same room. Be warned, though – co-op does not allow for an ever expanding frame of view like it does in Diablo III. You will need to move in the same direction and stay close to your co-op companions or you will feel like you are desperately pushing on the map to move in one direction or another. 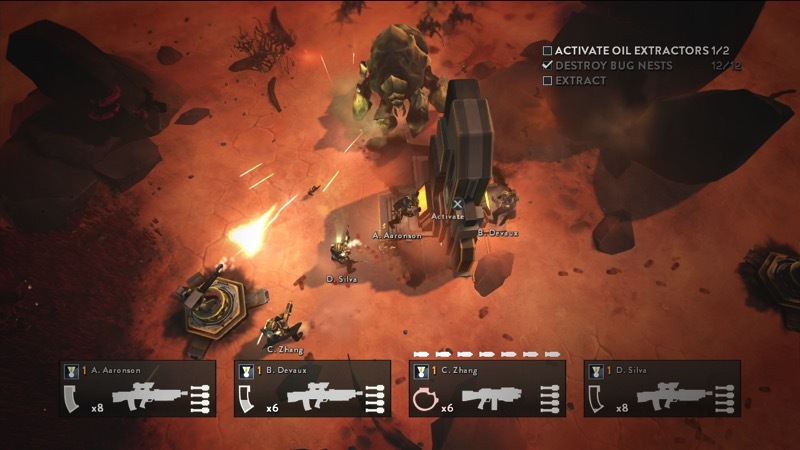 Helldivers is an easy game to pick up and play, especially if you are familiar with twin-stick shooters. However, the strategy and cooperative combat goes incredibly deep – after a couple hours of playing you’ll realize that you were doing everything wrong and that’s totally okay. As you progress and unlock new guns, stratagems and upgrades, it feels like the galaxy opens up for you. The game has a lot more to offer than initially meets the eye. Interestingly, Helldivers has some MMO elements as well. Players globally will shift the balance of power in the universe. Of course the alien factions will also be pushing back. I look forward to seeing how this plays out and I feel compelled to logon and do my part to push back the evil alien threat, building influence in the galaxy at the same time. The galactic war doesn’t seem to have a huge impact on the game as yet, simply providing a context for the missions. However, once influence reaches a high enough level, players can reach a homeworld for a full-frontal assault against the aliens. This will still take awhile to see as it will require a highly specialized and determined team of players to get to that point. As a ridiculously entertaining space romp, Helldivers is a fantastic game. There are some niggling issues, though. Characters can be customized with a range of clothing. However, even the most customized characters end up looking rather similar on the map. This means that I sometimes lost track of myself when playing with others, accidentally shooting people in the face because I thought I was behind them. Helldivers is excruciating and satisfying. It allows players to use a range of strategies for success and punishes failures without mercy. Challenging but never unfair, you may find yourself spending more time playing this than expected. 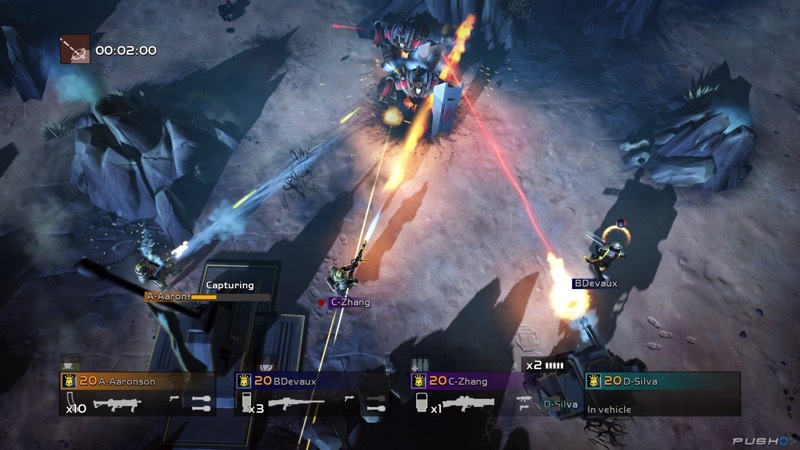 Helldivers is hopelessly addictive and brilliantly brutal. You will find yourself playing with a gleeful smile throughout, either thanks to crushing foes with your drop shipped turret or because of shooting your enemy with bullets full of freedom. Fast-paced and humorous with deep combat, this space romp should be required in every PS4 owner's library. Previous article Lazygamer Tournaments: What next?